You will be given a reference e-book to read which has 294 pages And the test will be based on that e-book , you can take final test within 1 year of purchase. Financial instruments accounting is known as one of the most complex areas in the accounting field. An individual desiring to become an expert in this area is required to undergo a comprehensive financial instruments accounting certification training to ensure that he won’t be making mistakes once he starts to do his job. Financial instruments can actually be defined as documents like drafts, checks, shares, bonds, futures, options contract and bill of exchange that come with a monetary value or signify a binding agreement which is legally enforceable between two or more parties based on a right to receive payment in monetary form. In a more simplified definition, financial instrument refers to a contract which results to a financial asset given to one party and an equity instrument or financial liability taken by another party. The accounting department of an organization is required to have enough knowledge about how to properly account for financial instrument transactions to ensure that everything is accounted and reported based on accounting standards. An adequate knowledge about proper financial instruments accounting is a huge help in significantly improving the financial instrument reporting’s usefulness to the different users of financial statements when it comes to formulating decisions. The good thing about the standards needed in accounting for financial instruments is that these are now simplified, making it easier for its professionals in the field to handle their tasks and responsibilities. Proper financial instruments accounting also aims to reconsider the process of measuring and recognizing financial instruments and address issues linked to financial instruments and hedge accounting’s impairment. Because financial instruments accounting is known for being a bit complex, you have to be well-equipped with the right level of knowledge about the proper and legal ways to account for financial instruments if you are serious about getting a professional career in this field. 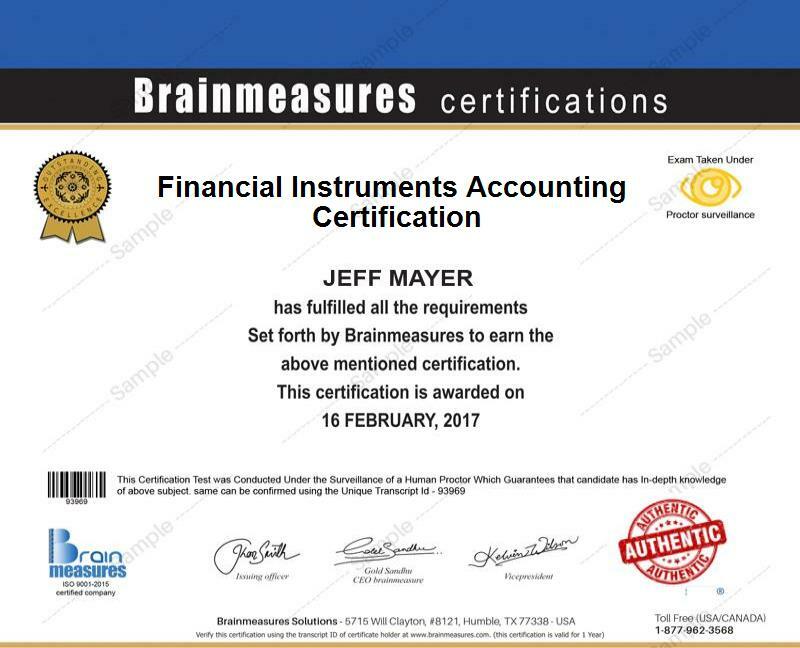 You will know everything about the field with the help of the financial instruments accounting certification program from Brainmeasures. The financial instruments accounting certification course offered by this legitimate online certification and testing company is filled with relevant information about the specific standards that you need to follow when accounting, recognizing, measuring and reporting financial instruments transactions. The program also covers a lot of topics linked to both accounting and finance. As a means of deciding whether you are worthy to take a hold of your certificate, an online financial accounting exam forms part of the program. You will become a certified expert in financial instruments accounting if you pass this financial instruments test. Brainmeasures financial instruments accounting certification program is a major help for individuals and professionals working in the accounting and finance department of an organization. This program is more beneficial for you if you are an aspiring accountant who wishes to become more familiar about the process of preparing financial instrument accounts. The financial instruments accounting certification course is also suitable for investors who wish to have an easier time evaluating the risk profiles of organizations that use derivatives. If you are already certified in the field of financial instruments accounting, then there is a great tendency for organizations to offer you an attractive compensation package. As a holder of financial instruments accounting certification, expect to receive around $85,000 to $194,000 annually for offering your expert and professional services.